Gujarati Cuisine has some amazing steamed snacks, Dhoklas being tthe most popular. As a kid I always went to a Gujju farsan shop to get these spongy lentil cakes. Now actually that spongy one that you see in the market is called Khaman. I had no clue that there was a variety of dhoklas and khamans available in Gujarat.My MIL makes the world’s best dokhlas. With her age she cant do much but we do get a treat once in a while.Following her recipe I do try to make them , but of course nothing like her’s. This is another version of dhoklas, where a mix of daals and rice is soaked and then grinded and steamed.The combo of these lentils makes the difference in the taste.There are still some more versions of dhoklas, will surely post those too , but for this weekend cooking here are some special dhoklas which are a hot favorite of the complete family. 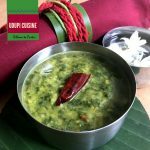 Valli and Champa join me for this cooking event, do check what they are cooking. Wash and soak the daals and rice for 4-6 hours. Grind to a paste, making sure it is neither too smooth nor too coarse. Add salt and curd and leave it for a few hours to ferment. (this depends on the weather, if hot it shall require less time to ferment). If you are in a rush one can go ahead without fermenting too,all you need is about 1/4 tsp of citric acid. Place water to boil in a dhokla maker . Grease the dholka trays or thalis. Add all the ingredients to the dhokla batter. Mix well , the consistency of the batter should be like idli batter. Pour into thalis, sprinkle red chilly powder and steam for 8_10 minutes or till done. The knife should come out clean. Add mustard , green chilly and pinch asafetida and curry leaves. As soon as the mustard cracks, add asafoetida, green chilly and curry leaves.Pour on the prepared cut dhoklas. 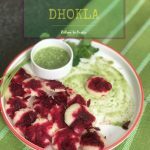 These dhoklas are very soft too and can be served with green chutney but I love to eat them with those tempered chillies. 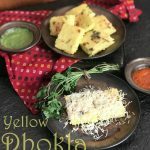 I just love dhoklas! Can eat them any time.. these look yummy! It's awesome, I lv it……….